I wake pain-free for the first time in years, literally years. My right knee feels strong, my left knee is on the mend and I can walk down stairs again, my toe pain gone. Hallelujah…..The Algae Fountain Pergrinos in Villambistia is working its magic and I feel strong…..bet Pam is cursing she didn’t stick her head in the algae now. We are not in love with the walks in and out of larger towns, they are always longer than they look on maps and my stupid estimates of distance are always out. 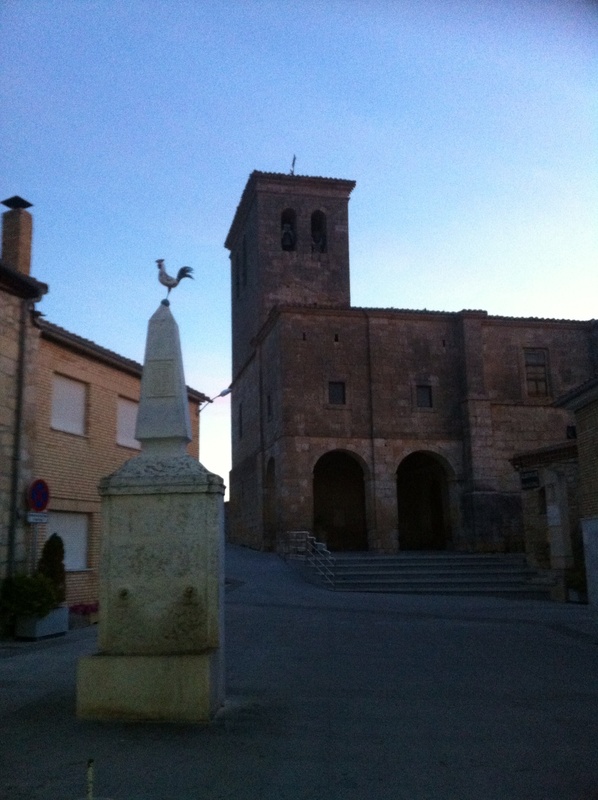 Burgos in the very early morning certainly has its charms. 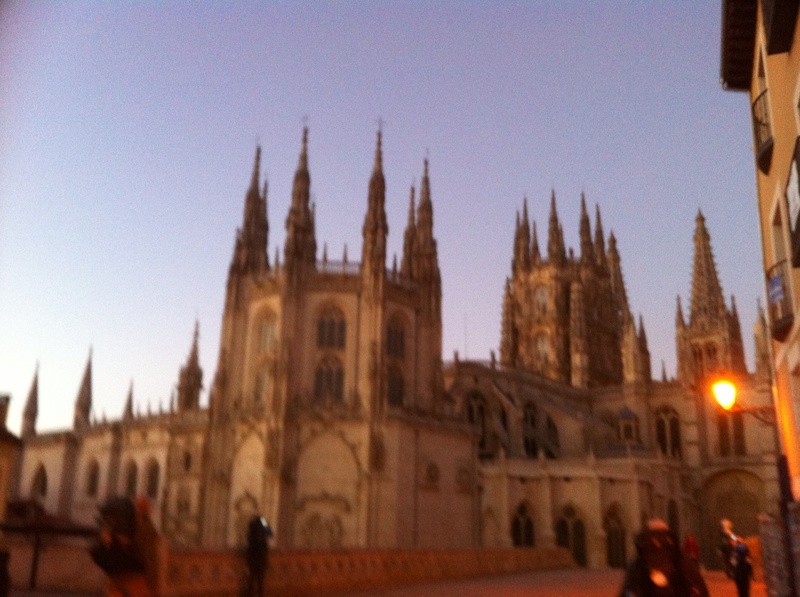 We walk past the Cathedral and do our best to get its ornate silhouette against the morning skyline (I have never owned a camera in my life and during the Camino I have felt some passion for photography stirring for the first time). I once had a very interesting conversation with a director of photography (DOP), who told me correctly that a movie is essentially a series of stills and that each still shot needs at least three different aspects or features to hold the viewers interest. So now in my mind a good movie shows at least seventy-two interesting moments per second. Sometimes it is hard to keep count. Since this conversation I hold this in mind each time I sense the right moment for a still has arrived. ’tis a poor craftsman that blames his tools I know, so I beg forgiveness for our less-than-tradesman-like shots taken with heavy backpacks and exhaustion swaying our hands. We walk down the canyon streets. Street width stays approximately the same however in the larger towns the canyons become deeper, five and six stories rather than the two or three in the smaller towns. Yellow arrows lead us out of the maze of the city following narrow streets that lead under stone arches in single traffic light directed lanes. The way leads us over what must be the only hill in Burgos and down towards the main road out of town where we divert through a walled park. Outside the park we see the only bronze statue I have ever seen of a person in a wheelchair. 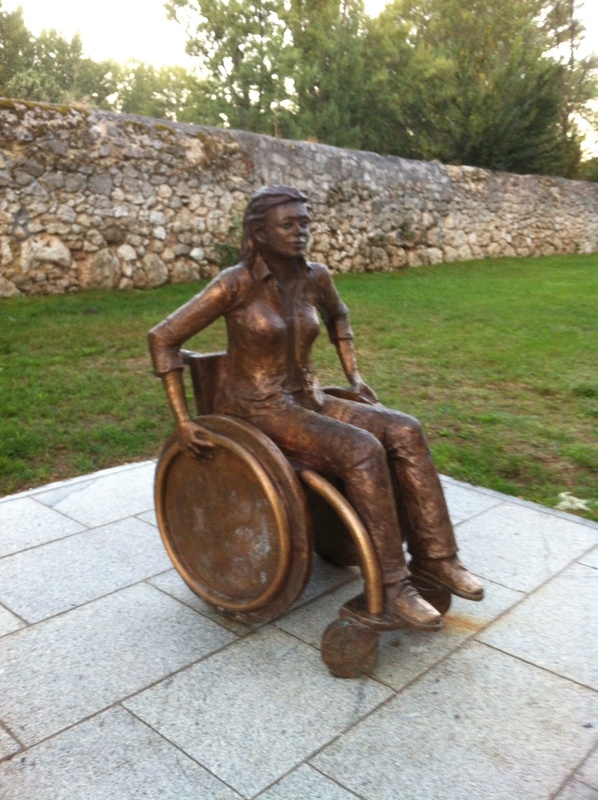 I hope this statue does not indicate that the Camino is wheelchair friendly because it most definitely is not. The park is ill kept and is being mowed at this early hour by a tractor and slasher. There are many other pilgrims walking with us and Buen Caminos expressed outwards in the cool morning air arrive as misty exhalations. We pass the University of Burgos as we near the edge of town and soon come to the last blocks of units marking the residential outskirts. Spanish towns come to an abrupt edge, like a sword has fallen from the sky. No ten acre pretend farms, no suburban paradise, we pass the last residential unit block and within twenty meters the two lane bitumen road whittles down to one. One hundred meters onwards the bitumen is mostly gravel, and then we are back on the white gravel road we have become so accustomed to. In and out, around and about, the Way leads us winding across roads, through underpasses and we take dogleg after dogleg. We are walking towards the railway tracks when a cyclist stops on a bridge going into some dinky town and starts yelling instructions that seem to indicate we are going the wrong direction. There are Spanish speakers around us who all seem to roll their eyes and shrug their shoulders and just keep walking, so Pam and I follow suit. The yellow arrows never lie (at least I hope they never do or we are stuffed) and there are some around the next corner. We have been walking for at least a couple of hours by the time we come to the first village for the day, Tarajos, and we stop for a break. The first shop is bustling and you just never know in these little towns if there will be a second, however as we come around the corner there are another three cafes awaiting our trade. Pam has a coffee and sandwich, I am sticking with fruit today (as I write this I am drinking fermented grape juice). 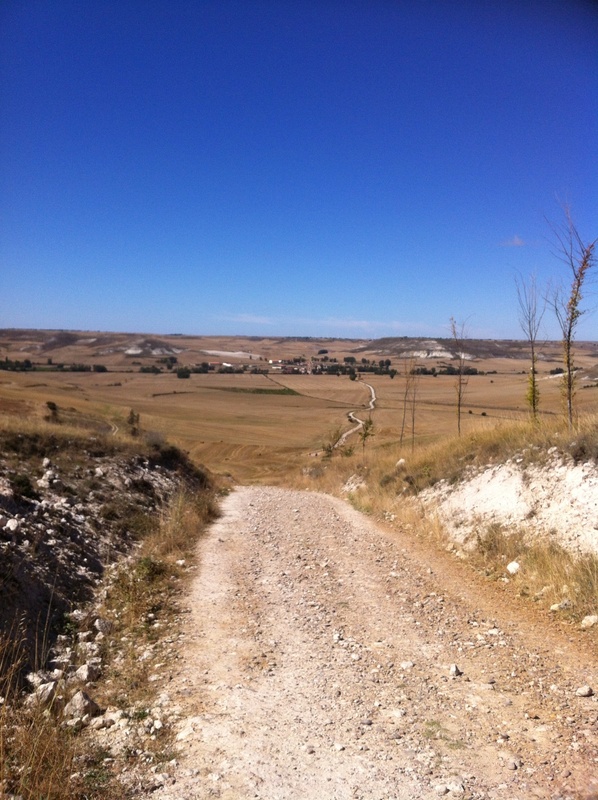 We don’t stay long in Tardajos, the Way leads us across the main road and into the outskirts of the village where we follow a single lane bitumen road crossing a couple of small bridges to Rabe de las Calzadas. 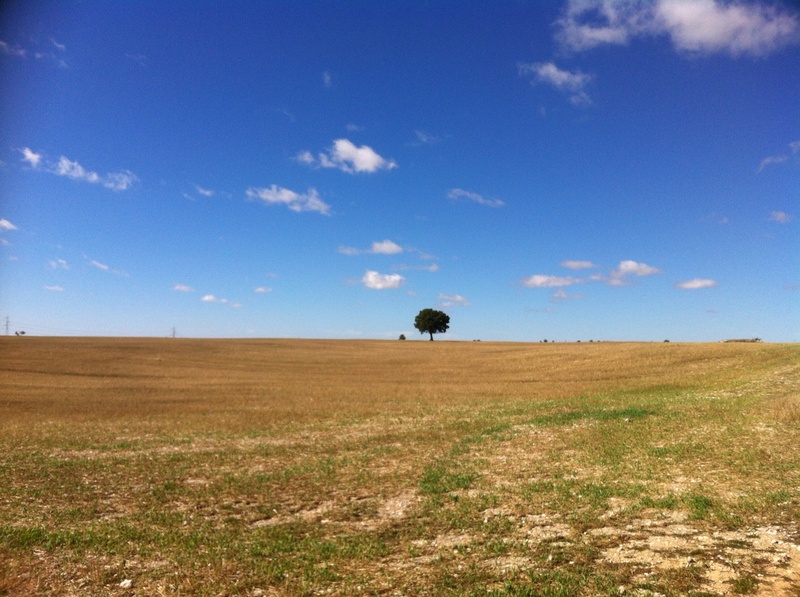 Rabe de las Calzadas is a small prosperous looking village, for the first time we pass a field of fresh mowed lucerne winnowed and awaiting baling. To misquote a line from a famous movie that also starred Martin Sheen (Apocalypse Now) I love the smell of Lucerne in the morning. As mentioned earlier I am feeling strong and I charge through the town almost before I have realised we have entered it. On leaving I notice Pam has been left behind and I wait for her to catch up. She tells me ‘if I wasn’t in such a hurry I could have stopped to dip my head in the fountain’. I looked at the fountain and didn’t notice any Ju Ju Algae so just kept on keeping on. I wait for Pam to catch up at the end of town, the long gravel road stretches out before us, as far as I can see, uphill. We start the ascent, my metronome poles click out a faster rhythm than ever today, I am powering up the hill and have to keep waiting for Pam who is feeling a cold coming on and is a bit poorly. The road winds up and up, the gradient is not steep however the uphill section lasts for at least two kilometers. Near the top a beautiful grove of trees shades a few park benches and a hand operated water pump where we stop for a rest and meet an Australian woman Robyn. Robyn was familiar with Rochedale and had ridden horses in her youth on a property on Rochedale road. ‘It’s a small world after all’ rings in my head. We finally crest the never ending slope and are surprised to find the road just keeps on stretching out on flat land. 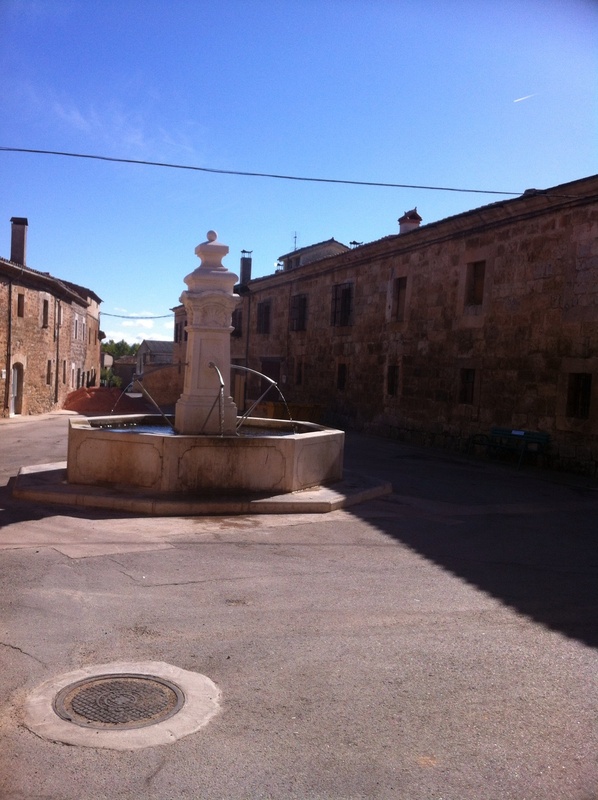 Robyn had told us the town we hope to make soon is about five kilometers on. The Spanish countryside has changed remarkably during our days walk, the hills are now formed from eroded limestone and support little vegetation. Trees are low and few between, the sun is beating down and Pam is walking slower and slower. Finally Hornillos comes into sight, down at the bottom of the steepest descent we have seen in days. My knees are firm and strong, my pacerpoles stretch out in front of each footfall, I make the bottom and wait for Pam who is looking very tired by now. We walk the final kilometer into town along the flat and collapse onto a bench in front of the only store in town. On the way into town Pam has said to me ‘we stop at our hotel or the first place selling cold drinks, which ever comes first’. After resting we go to pick up our backpacks, Pam changes from her boots to her sandals and we plan to make our way through town to look for our hotel. I ask Pam ‘could it be that door across the street’ as we put on our backpacks, she looks in our guide and laughs. Shower and launder, the ideal daily ritual follows. As I write this last portion, it is late at night, I have participated in at least three halves of bottles of the fermented grape chilled. We have interesting conversations this evening that pierce the veil of the mundane. We run into Chantal whom we met two days before. She and some companions await the sunset when they plan to walk until whenever under the stars. Twenty years ago I would have willingly joined them. Tonight we have a rare double bed, it is soft and warm and I shall lie next to my love and watch the stars from our sky light. We meet Stefan, a German poet unknown to himself, who has two hearts (‘I have two Stefan’s in one heart’), and wants one heart to win. We meet a fellow Aussie Warren, who fights the real battle head on. We see and ‘chat’ (Stefan did all the talking) with the legendary French Camino couple in their late 70’s we have heard about for the last few stops. They are walking the entire Way hand in hand. They walk away from us serenely smiling, hand in hand. We meet another lovely older German man Joseph who has walked 500km each year from his home in Nuremberg, Germany to where we now meet. His 500km for this year will end in Leone. Next year his 500km takes him to Finestere. I ask if he is going to buy scuba gear to continue his journey the year after and he laughs saying ‘maybe, or maybe I start walking back to Germany’. We dine with Pete and Maggie, two lovely Aussies who live ten minutes from where we call home. The conversation deepens until it is my turn. I seem to have the knack of taking the one step judged too far and despite my lovely wife kicking my legs from under me, I relate how the Raft of the Medusa in the Lourve spoke to me regarding the frailty of our social conventions. Always one step beyond proper dinner conversation, story of my life. Love the story of the 70 year olds hand in hand! This is such a romantic entry! Lexi, you hit the nail on the head with your last comment, your parents are so cute! Pam, fingers crossed you get well soon! Mick, I’m glad to read your recovery of toes and limbs is going well! Hi Pam and Mick! 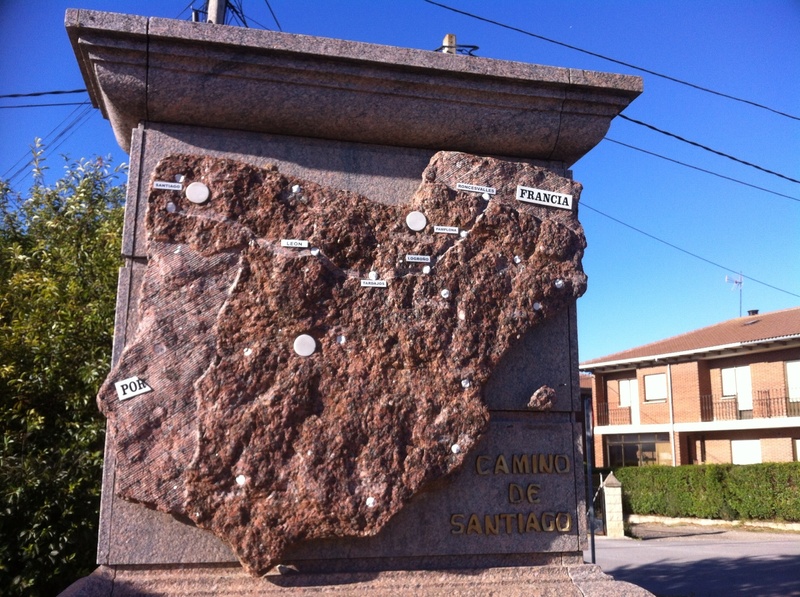 I’m enjoying your camino story! Both where your story is similar and where it differs from mine; it’s quite entertaining! I especially love reading of your encounters with people I also knew. I love Tim and Sue! We had dinner with them in Larrasoaña! And also Susan and Amy – we met up with them several days along the way and became good friends! I had to leave from Burgos on Sept 13 to come home, but Anita carried on so it sounds like she’s a few days ahead of you. I loved meeting you and wish you well in your year of journeys! Buen Camino!! !